When it comes to innovative content marketing and customer service, let’s just say the financial services industry hasn’t taken a leading position. Yet as customer relationships evolve from in-person transactions to omnichannel engagement, consumer-facing banks and insurance companies have realized it’s time to step up their game. “One of the primary drivers as to why banks are late to the party is the legacy systems they are dealing with,” says Steve Facini, chief marketing officer for ondemandCMO, a New Jersey-based marketing firm. He works with financial clients and worked for Citibank. “Today’s banks grew to the sizes they are through acquisitions, so it’s difficult for them to integrate all of that information into one system. It’s also a heavily regulated industry,” he says. As a result, being a few beats behind has opened the door for fintech – financial services companies focused on technology and innovation – to swoop in and offer a better user experience than traditional banks can manage, hence the success of brands like Lending Tree, SoFi, and Rocket Mortgage from Quicken Loans. “They are focusing on specific niches of banking and can do it better and quicker. However, even though fintechs might have a better widget, they have a problem gaining trust, and therefore, it’s tough for them to scale,” says Facini. In other words, winning the loyalty of today’s customers requires a combination of cutting-edge, customized digital, and mobile engagement, as well as the credibility gained from offering industry-leading expertise during the in-person branch experience. Why do banks need to master both? Consider this: More customers than ever are using mobile banking (49% of millennials, 31% of Gen X, and 16% of baby boomers), according to J.D. Power’s 2017 Retail Banking Study. Yet 71% of banking customers visited a branch an average of 14 times over the past year. Take a look at what some banks and financial companies are doing to gain a marketing edge. “Physical presence is still the No. 1 driver of customer acquisition … period,” says Gina Bleedorn, chief experience officer at Adrenaline, an experience design agency based in Atlanta. That’s why banks are heavily investing in branches even if they are limiting the number of branch openings. To maximize remaining retail space, banks are gradually redefining their purpose. “Technology is enabling routine transactions to occur outside of the branches, whereas traditionally tellers facilitated them. Now, banks are looking to have a dialogue and give advice and consultation to the customer. The new branch purpose is not in depositing checks – it’s in providing value,” Bleedorn says. It’s also about creating community connections and building relationships. When Northwest Resource Federal Credit Union wasn’t generating enough new business, it decided it needed a brand makeover. The company hired Weber Marketing Group, a branding agency focused on financial clientele. 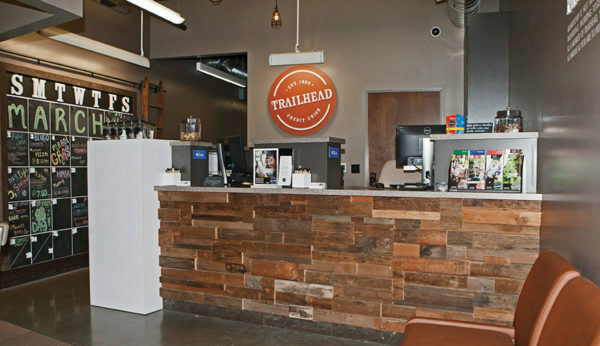 Today, the credit union operates under a new name, Trailhead Credit Union, and it has transformed its look and messaging to connect with the urbanite spirit of Portland, Oregon, residents. It’s essentially a bank that feels more like a neighborhood hangout, even offering free temporary tattoos to kids (way cooler than lollipops!). Since the rebranding, Trailhead has set growth records for new accounts, loans, and branch and web traffic every month, according to Weber’s case study – all thanks to its commitment to celebrating the culture of its customers. Finances are complicated, and banks able to teach customers something or curate the massive amounts of data can win customer loyalty, says Bleedorn. That’s why firms like Charles Schwab host educational workshops. In fact, educational content can be one of the key differentiating factors among competing institutions. “If I can teach you and advise you, or help you select a product, that is huge,” says Bleedorn. Liberty Mutual recently launched a partnership with HowStuffWorks and Amazon’s Alexa to provide educational content through the voice-activated home gadget. Users can ask Alexa to “open Liberty Mutual” to access educational kits on topics like how to prepare for a hurricane or questions to ask your car mechanic. If you don’t have an Amazon Echo, you can access the MasterThis content portal on Liberty Mutual’s website. Society of Grownups, the educational arm of Massachusetts Mutual Life Insurance Co., recently closed its physical location to focus on free online financial literacy courses – something that resonates well with its younger audience. The classes last 25 minutes and offer free downloads. The site also features a blog and tools to help guide financial decision-making. There’s no hard sell for MassMutual either, making it a pure content marketing play. Content marketers across industries have been trying to crack the code as to how to keep millennials engaged, and in banking (which is traditionally geared toward older people and their wealth management needs), it’s a shift we’ll be seeing more and more. “Millennials are not only a huge generation of their own, but they are influencing the other generations. They are the early adopters,” says Bleedorn. And because they do their research online before making any decisions, when they go into a bank branch, they expect a higher level of expertise, she says. This past November, Santander Bank launched a new content marketing strategy aimed at connecting with millennials who may be a couple of years away from applying for loans. “We wanted to talk to people earlier in their decision-making process, and wanted our content to be found when they had lifestyle questions,” says C. Decker Marquis, senior vice president and director of digital, social media, and multichannel marketing for Santander. 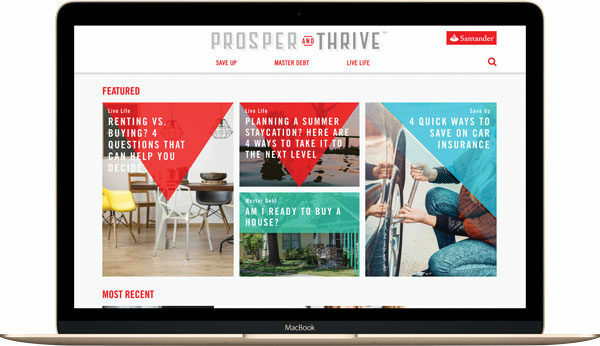 The content, under the umbrella of Prosper and Thrive, lives at the site thehub.santanderbank.com, where a dozen articles are published each month on topics that fall into three categories: saving up, mastering debt, and living life. What’s surprising is that viewers are more likely to find tips for a summer “staycation” or how to find a budget wedding gown than stories focused around banking products. “You wouldn’t necessarily think about coming to a bank for the types of stories we feature, but we want our audience to feel like we understand them and their goals,” says Marquis. And Santander works closely with content management, social distribution, and SEO partners to ensure the content is discovered. Before launching, comprehensive research into its target audience provided Santander with enough insight to convince the executive team that content for millennials was a good investment. 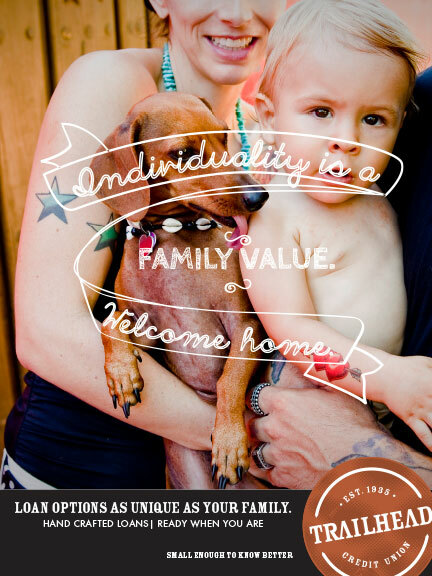 “We want to be there for those in-between moments, before customers look for a home-equity loan,” says Marquis. So far, she says, they are meeting their engagement and conversion goals, driving traffic to their core banking website, and gaining insights about the audience through surveys. The next step will be figuring out how to repurpose the content across all channels, including inside the branches. Overall, the strategy is to attract would-be customers and win their loyalty so that when they’re ready to shop for banking products, Santander will be top of mind. Another thing that resonates with the digital generation is innovation. That’s why some banks are launching innovation labs to showcase their future-forward efforts to the public. Part of the rationale could be to counter (or keep up with) the fintech movement, but it’s also a way to generate buzz. “A brand innovation play says ‘look how innovative and dedicated we are to being ahead of the curve,’” says Bleedorn. Although many of the well-known experimental spaces are found internationally, among institutions doing this in the States are USAA, with its design studio in Austin, Texas, and Bank of America’s “customer experience” lab located above one of its Silicon Valley branches. The America First Credit Union recently opened an innovation space in Salt Lake City, Utah. 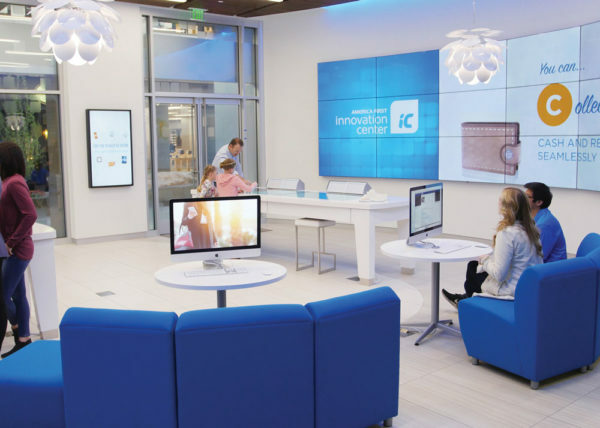 As one of the largest credit unions in the United States, the American First Innovation Center is designed to test new technology and get real-time consumer feedback. Bleedorn’s team at Adrenaline helped launch the project. Among the space-age features: on-demand hologram conferencing with off-site experts, real-time polling about what’s important to each customer, and new teller cash-recycler machines to test. “It’s a really cool space designed to figure out what technology people want to use, and how they want to use it,” says Bleedorn. Once the credit union knows which things are working, it will begin rolling out to the branches. At the end of the day, people want to feel important and be known on an individual level, says Facini. That is why banks are trying to go all-in on personalization. “Knowing your customer’s needs and anticipating their next move is critical moving forward,” he says, pointing out that consumers expect their digital banking experiences to be as efficient as the business they do with the Amazons and Zappos of the world. Facini cautions, however, that financial health sometimes requires a human touch, and customers can’t have a relationship with an algorithm. “The banks that will be able to win are those that can figure out how to use technology to scale that one-to-one personal relationship,” says Facini. In the spirit of Apple’s Genius Bar, Bank of America deployed 3,800 “digital ambassadors” last year to work in branches and assist customers who were interested in maximizing the bank’s online and mobile services. The in-person demonstrations and mobile app hand-holding are great examples of putting a human face onto a digital experience. Expand your financial services content marketing skills. 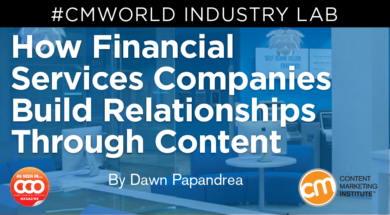 Make plans today to attend the Financial Services Industry Lab on Sept. 8 at Content Marketing World. Use the code BLOG100 to save $100.